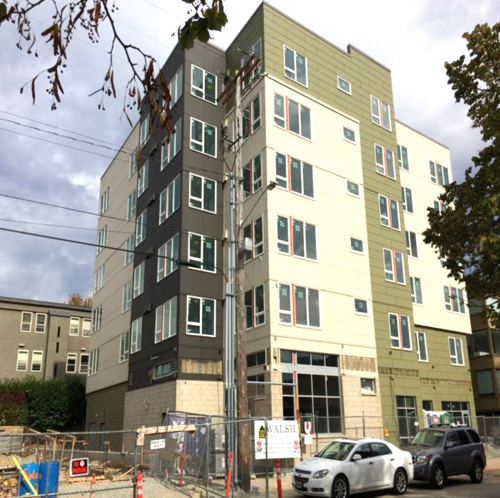 The Low Income Housing Institute (LIHI) announces the availability of 50 brand new Senior HUD-subsidized affordable apartments located in the Ballard neighborhood of Seattle, close to the Seattle Public Library, Ballard Commons Park, NW Market Street and the Majestic Bay movie theater. Occupancy begins January 2015. Cheryl Chow Court offers the opportunity for income qualified tenants to pay 30% (about 1/3) of their adjusted monthly income for rent. A HUD Section 202 Project Rental Assistance contract with the U.S. Department of Housing and Urban Development provides a rent subsidy to residents of the 25 studio and 25 one-bedroom apartments and will pay the difference between the tenant payment and the scheduled rent for the units. Each household must include at least one member age 62 or older. The studios and one-bedroom apartments include a full kitchen and bath, including level-entry showers. The community has apartments accessible for those with mobility challenges and are accessible to the hearing and sight impaired. The building features a lobby, mailbox area, resident lounge, computer bank, library, group kitchen and program space and professional on-site management. There will be gardening on the outdoor rooftop. The resident services coordinator will organize outings and activities geared to the interests of residents, and provide referrals to community services as needed.